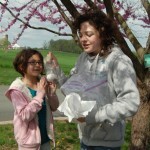 Sixth grade students at Martic Elementary look forward each year to the annual egg drop, The egg drop is a culminating activity to the physical science unit – gravity and motion. The students relate concepts from the unit to how objects move/fall. Prior to the drop, students do a mini experiment to see what affects falling objects – gravity, mass, air resistance, force/impact, aerodynamics, etc. 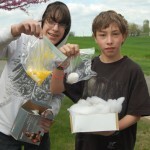 The students are challenged to come up with packaging that will keep a raw egg safe when dropped. 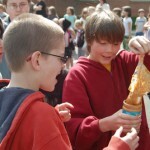 Some of the creative packaging used included marshmallows, bubble wrap, foam, towels, and peanut butter! 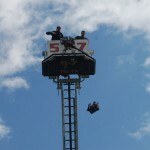 The Quarryville Fire Company helped out again this year and the eggs were subjected to a 75 foot drop. The combined survival rate of the three sixth grade classes was 49%.